Commercial Stone Floor Cleaning Bristol Made Easy. Are you struggling to find a Commercial stone floor cleaning Bristol company as you can not get your stone floor clean? Are you at the end of your tether with it all? You’ve asked your daily cleaners about cleaning your stone floor and you have tried every stone floor cleaning product on the market and still it looks bad? Obviously you haven’t contacted CleanAndSealUK yet. We make easy work of any commercial natural stone cleaning. Our stone floor cleaners are here for you to discuss your requirements whether it’s stone tile cleaning or cleaning a stone floor. Leave us a short email about your commercial stone cleaning issues and we will reply at the earliest opportunity. 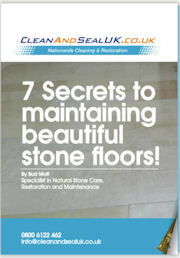 Whatever type of commercial stone floor you have in your property, CleanAndSealUK can clean and seal it for you. We won’t just clean and seal your commercial stone floors in Bristol though. We can condition and rejuvenate your stone using only the best products for your individual stone type. you can be assured that that we will apply colour-enhancing impregnating sealers that bring out the amazing colours that your natural stone floor has lost, and also apply the best topical stone floor sealer. By contracting CleanAndSealUK commercial stone floor cleaning Bristol and sealing services you will not be disappointed, and we offer you a 100% money back guarantee if you are not completely happy with our service. So your stone floor needs restoring. After so many years of cleaning and maintaining your natural stone floor the time has come for a total stone floor restoration. CleanAndSealUK can offer you a bespoke commercial service for whatever stone floor, just like this flagstone floor that was cleaned and sealed in Taunton by us, or natural stone tiles you have in your commercial property. 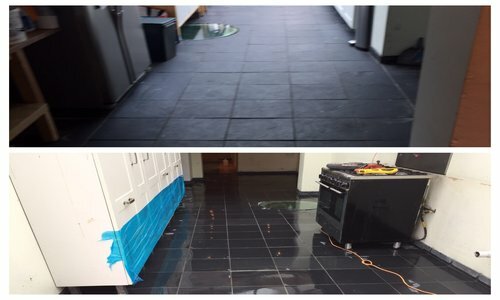 If your stone floor needs re-grouting or you have cracks that need repairing, chips that need filling in or wax and sealer removal then contact us today. We offer you a commercial stone floor restoration Bristol service for every stone floor available. Contact us today to find out more about our commercial stone floor restoration Brsitol services.